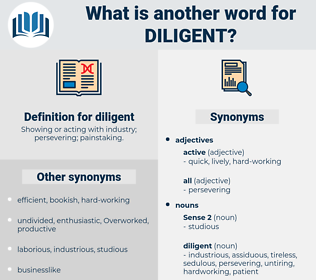 What is another word for diligent? Showing or acting with industry; persevering; painstaking. thorough, vigilant, timely, attentive, strenuous, persistent, unremitting, untiring, rigorous, hard, proactive, prompt, tenacious, stringent, speedy, conscientiously, disciplined, thoughtful, applied, detailed, earnest, efficient, sustained, active, scrupulous, steadfast, serious. 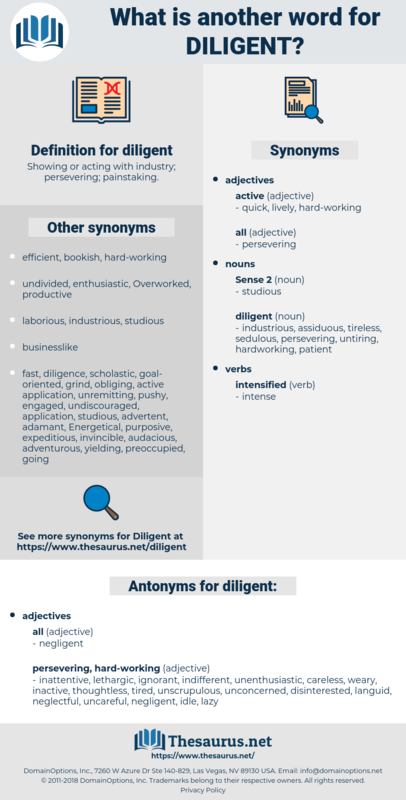 hardworking, hard-working, conscientious, painstaking, indefatigable, tireless, meticulous, relentless. lazy, unconcerned, lethargic, disinterested, tired, idle, weary, inactive, unscrupulous, unenthusiastic, languid, uncareful, neglectful, careless, ignorant, inattentive, indifferent, thoughtless. inoperative, quiet, latent, dead, quiescent, dormant, sluggish, heavy, slow, remiss, indolent, nonoperating, lifeless, asleep, free, hit-and-run, impatient, passive. Your suitor is a worthy young man, an honest, honourable fellow, a good liver, a diligent mechanic, and handsome to boot, and, which is the main thing, he has for a long time loved you truly, loyally, and ardently. The search was a most diligent one.